Australia will embark upon a frenzy of infrastructure development in order to alleviate the severe pressure on transit systems created by population gains. The new infrastructure works will require effective noise pollution measures to prevent vehicle or train traffic from disturbing adjacent residential areas. Such noise pollution solutions will be especially important in urban areas expected to see sharp increases in population density, and thus host greater amounts of traffic adjacent to residential zones…and EnduroMax is ready. The EnduroMax panel is currently enjoying rapid uptake amongst engineers, civil contractors and developers in Queensland thanks to the endorsement and support of the state government. The Queensland Department of Transport & Main Roads subjected the panel to a barrage of rigorous tests against its MRTS15 specification, which is notorious for being the most challenging benchmark in terms of impact resistance. The EnduroMax panel passed the tests with flying colours, and the department has emerged as a strong advocate for utilisation of the panel on road and rail walls as well as land developments. Other Australian states may also soon follow Queensland’s lead in adoption of the EnduroMax panel, with NSW Roads and Maritime Services already opting to utilise the product for two new projects, and ModularWalls currently in discussions with Main Roads WA and VicRoads engineers. The EnduroMax panel provides road and railway engineers, designers, contractors and asset owners in Australia with a highly effective, rigorously tested means of curbing the noise pollution produced by heavy vehicular traffic. ModularWalls has designed and engineered the product to achieve a minimum sound insulation rating of Rw31, meaning the panels can cut noise by a hefty 31 decibels averaged across the spectrum of acoustic frequencies. The product performs especially well with those frequencies of noise pollution associated with road and railway traffic, exceeding the acoustic requirements for most of civil infrastructure projects. The EnduroMax is compliant with all the main specifications for acoustic walls and noise barriers in Australia, and has obtained pre-approval from the Queensland Department of Transport and Main Roads after undergoing a barrage of rigorous testing against the MRTS15 specification. Given the increasing emphasis placed by both business and government on sustainable economic development however, it’s also imperative that any noise pollution solutions have a low carbon footprint and produce minimal impact on the environment. The EnduroMax has a much smaller impact on the environment compared to the precast concrete panels that are generally employed to achieve sound attenuation on transportation infrastructure projects. ModularWalls conducted a case study of the carbon footprint created by the installation of a noise wall running a distance of 1000 lineal metres, and the EnduroMax panel provided a massive 80% carbon reduction across the project against concrete The study concluded that the use of the EnduroMax panels would result in dramatically reduced CO2 emissions across all stages of the project, including the manufacture, transportation and installation of the panels. 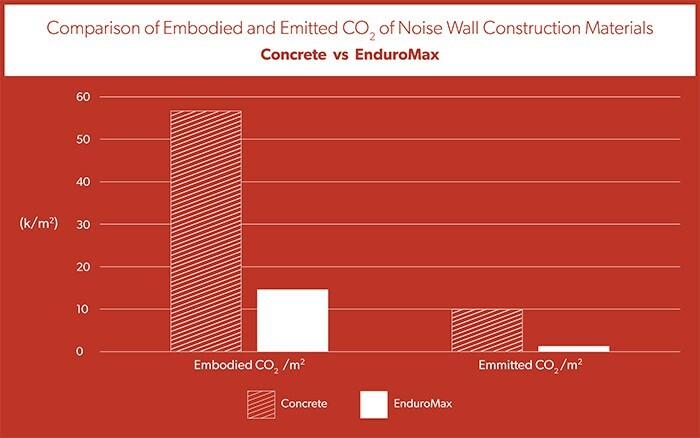 The embodied CO2 of the EnduroMax Panel itself is just a third that of precast concrete noise wall panels measuring the same dimensions, at 90.73kg as compared to 271.2kg for a 4m x 1.2m x 0.125m product. This translates into savings of roughly 135.35 tonnes of embodied CO2 for the noise wall specified by the case study. The low weight of the product means that transportation of EnduroMax panels for the wall would incur only 9.58 tonnes of CO2 emissions over a distance of 1000 kilometres, as compared to 74.52 tonnes for the traditional concrete option, achieving a savings of 66.9 tonnes of CO2. During the installation phase of the project the modular design of the EnduroMax also achieved major greenhouse gas reductions due to quicker and more convenient construction, with a CO2 load of 6.3 tonnes as compared to 16.53 tonnes for precast concrete panels, or a savings of 10.05 tonnes. 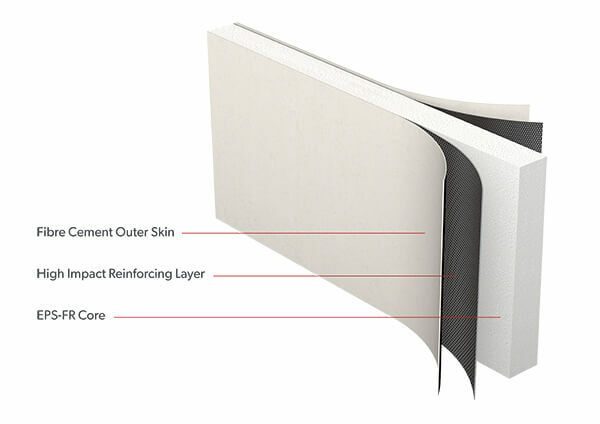 In addition to shrinking the embodied carbon footprint of infrastructure noise walls by 66%, the lightweight modular design of the EnduroMax™ also enables developers to achieve major savings via reductions in transportation and installation costs. While a concrete panel measuring 100mm in thickness weighs approximately 240 kg per square metre, the EnduroMax clocks in at a mere eighth this amount with a weight of 30.5 kg per square metre. This means far more panels can be loaded onto trucks during transportation, dramatically reducing the cost of conveying the product from the manufacturing or depot location to the building site. The low weight and modular design of the product also makes it far easier for builders to handle and manoeuvre. The panels can be moved manually instead of requiring expensive equipment such as cranes or lifting jigs, and readily lend themselves to on-site cutting or customisation using circular saws. This ease of handling can make installation of the EnduroMax panel thirty to fifty per cent faster compared to precast concrete panels, which translates into major savings in terms of equipment hire and labour costs. The EnduroMax panel is the optimum noise wall solution for reducing the noise pollution created by transit infrastructure across Australia. It dramatically reduces the cost and construction time involved in the creation of infrastructure noise walls, helping asset owners to maximise the returns on their investment. It in addition to its strong performance and low cost, the EnduroMax panel also minimises CO2 emissions at all stages of development, for a noise pollution solution that is environmentally friendly as well as effective and economical. Local government is already well aware of the pivotal benefits brought by the EnduroMax panel, with Queensland pushing for its adoption on road and rail projects as well as land developments after subjecting the product to the most rigorous of impact resistance tests.